I love, love, love yellow roses. I hand painted this shabby rose sign with luscious chic yellow roses, added lavender wildflowers with a blue bow and the word, '' MARKET'' I added a little distressing for a warm farmhouse country, cottage feel. 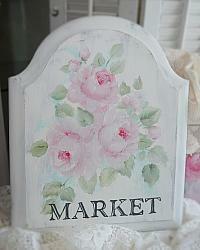 The sign would look great mixed in with other shabby chic Farmhouse cottage décor. It is appx. 11'' x 13'' and is signed.